Quality fictional biography of Oswiu, Dark Ages king of Bernicia, one of the early Christian kings. Amazing what the author has done with a mention in Bede--a fully-fleshed novel, with the same excitement of battles and court intrigue, and sometimes wry humor that marked the author's earlier books in the trilogy. The novel brought that whole period to life. I'm glad Bran, Oswald's pet raven, made appearances here; each one marked a turning point in the story.Most highly recommended. In 'Oswiu: King of Kings', Edoardo Albert brings to vivid life the battle for the land and souls of the British people in the seventh century. Albert tells an epic tale of kings and queens, omens and shieldwalls, where the future of a people was decided as much through the guile of its priests as the strength of its warlords. Edoardo Albert deftly weaves the threads of a memorable cast of characters into the weft and warp of a vibrant tapestry of war, mystery and intrigue. Yet the true strength of 'Oswiu: King of Kings', is in the depiction of the effects of conflict on the men and women of the Dark Ages, as Albert reminds us there is much more to conquest than the ringing clash of swords. 4.5 Stars Oh my goodness, I am going to miss this series. Never mind, the paperbacks are all on my shelf anytime a re-read becomes necessary. London based author, archaeologist and journalist Edoardo Albert has bought his Northumbrian Thrones trilogy, encompassing the lives of three seventh century rulers of the Saxon Kingdom of Northumbria to a conclusion in magnificent style, yet not detracting from the known historical facts. Oswiu was a supporting character in the last book, the younger and somewhat less confident brother of the Saintly King Oswald (both of them nephews of Edwin, the focus of the first book). I say Saintly quite Literally. The Seventh century King Oswald of Northumbria is actually a canonized Saint in the Roman Catholic church. After the deadly trap with kills his beloved brother, Oswald, at the behest of his mother Acca, embarks on a quest to retrieve the remains of his brother- impaled to a tree in an act of ritual humiliation by Penda King of Mercia, the perpetual enemy of the Northumbrian monarchs. The scene in which Oswald's pet raven, Bran, exacts his own sort of vengeance for his master was one of the most memorable in the book. Indeed, Bran has emerged as a character himself in the course of the series. I appreciated the way that the role of royal women was represented in this tale, as they are so often considered powerless and marginalized: in reality, they were the Peaceweavers. "It is the part of women in this Middle-earth to weave together kingdoms in our bodies and on our beds, to requite war with desire, to make peace with the children we breed. That is our part. " The book then proceeds to follow the first 13 years of Oswui's reign, revolving mostly around his power-struggles with Penda, and efforts to secure the throne of Deira, which alongside the small Kingdom of Bernicia from Northumbria as a whole. (For international readers, this was the ancient Saxon Kingdom, encompassing much of what is now NorthEastern England North of the River Humber, as well as parts of Southeastern Scotland.) It is a complicated story of shifting loyalties within families, loss, betrayal, death, and ultimate victory. Interwoven within is the story of how the English Church grew in this formative period and the faith of the characters themselves, Oswiu and his relatives, as well as Aidan, first Bishop of Lindisfarne, who according to tradition, prevented the destruction of the great fortress of Bamburgh with his prayers. In this last book, a new element is introduced when Penda claims to be the embodiment of the god Woden on earth, and turns his expansion of power into a clash of gods, making it his goal to eradicate the new religion from the lands of the Angles, along with all the Kings who have embraced it. Never believing he can truly be the match of his brother, Oswui and his family must fight, in the end for their very survival. In the course of events, Oswui makes some hard decisions and takes controversial courses of action. His likely complicity in the murder of the Christian King of Deira (and his Kinsman) Oswine 'Godfriend' has been a blot on his reputation across the centuries. Deservedly so. Oswine here emerges as a sympathetic and tragic figure: a King who never really wanted to be one, a man who wished to do right, caught up in the turbulent tides of power. This was a world in which men of God could barely avoid violence, and the fate of Kingdoms was decided at the point of a sword. My only complaints were that the book was not long enough. OK, not really. It was 550 pages long, but Oswui reigned for another 15 years after the novel ends, one of the longest reigning and living of all the pre-conquest Kings. A lot happened in that 15 years, and I think it would have taken another full-length book to cover it all. Still, I would have liked to hear a little more about that period. The other was some of the fantasy- like elements in the story, which though they were well written, I felt weren't always necessary. Such as the suggestion that Oswald's Spirit lingered in the form of a black cloaked figure, who at one point stands next to Oswui and is spoken to by him. Overall though, this novel and the entire trilogy have proved to be an excellent contribution to the genre, in which Pre-Conquest Britain is often her ignored or is represented in whimsical Romance novels with cliched or stereotyped characters. Recommended for lovers of solid and immersive Historical Fiction, and easily ranked among better-known authors. The story of Oswiu reads like the best of fiction but is rooted in history. It is a beautifully told story, most enjoyable to read, exciting at times, and has expanded my knowledge and understanding of the ‘Dark Ages’. Oswiu brings to a conclusion The Northumbrian Thrones Trilogy in which Edoardo Albert has brought the past alive for me in a way that nothing has before. Reading the trilogy has been like eavesdropping on the lives of those who lived in the north of Britain in seventh century AD. Each book is complete in itself and enhanced by being part of a trilogy.Edoardo Albert is a great story teller, has a delightful turn of phrase and uses metaphor brilliantly to capture the atmosphere of the times and events. The people, conversations, habitations, travel, countryside, weather, clothes, battles… he might have been there himself. The dialogue is convincing and I love the subtext in some conversations.I found it interesting to read about the introduction of Christianity and the conflict with believers in the old gods. Similarly the lives of women of high birth and those people kept as slaves were a natural part of the story and described as they were without judgements based on modern values of feminism and freedom.This trilogy has opened up my mind to the value of historical fiction. It is set at a place and time about which I knew nothing but have now gained a small understanding of what it was like and I have been left wanting to know more.I don’t have Edoardo’s facility with words and story but I have done my best to do Oswiu justice as it such a good read and I enjoyed the whole trilogy enormously. I hope there will be more of similar ilk.The Northumbrian Thrones 0n Edoardo Albert's Blog is most interesting if you want to know more about the history.I was lucky enough to read an advance copy as the author sent a copy to my author husband. It is such a pleasure to discover more historical fiction inspired by the 6/7th century Anglo-Saxon history. This is the third part in Edoardo Albert's The Northumbrian Thrones series. The previous books told the stories of King Edwin of Northumbria and King Oswald, both of them warriors, but also considered Saints and classical heroes. I have enjoyed all of the books, but found this third part even more gripping and exciting. Oswiu, Oswald's younger brother is flawed, crafty, clever and resourceful - a very real human being and all the more fascinating and unpredictable for that. Having lived in the shadow of his heroic and high-minded brother, the story opens with Oswiu failing to convince the Witan of Deira that they should accept him as their king. Also failing in his marriage to Rhienmelth of Rheged, Oswiu sets out on a desperate mission to reclaim Oswald's remains from the Mercian battlefield where he fell. Taking only his closest, most trusted companions with him he ventures into the territory of Penda, the fierce high-king, hoping to impress both his wife, his family and his followers with his achievements and consolidate his position as king of the whole of Northumbria. Edoardo Albert has developed an imaginative and believable plot that never strays far from known history. I particularly enjoyed the development of so many strong female characters that emerge from the shadows as resourceful, resilient women: Acha the mother of kings, Rhieienmelth of Rheged, Eanflaed the Wise and not least Ahlflaed, Oswiu's courageous daughter. Enormous excitement and tension builds towards the end of the story, as Oswiu is forced to face his relentless foe, in a final battle. I found the book quite unputdownable! Edoardo Albert manages to create a world into which we can slip unnoticed and watch the lives of kings and those who move around them and take part in their lives, and their decisions of life and death. Of course this is fiction, but well researched and rooted in history, and brilliantly written. Part of a trilogy bringing in a huge amount of research as well as imagination - a marvellous melding of the two which hopefully will be an invitation to many to enter another world. It helped me survive a difficult couple of weeks. Edoardo Albert has again outdone himself. He has completed his trilogy with a flourish, leaving the reader wanting to know more about the world his characters find themselves in. I find historical fiction fascinating but none so much as that placed in the Brisith Isles in the middle ages. Albert has taken the scant historical information available to us about this early medieval period and has woven a fascinating, vivid, and believable tale of the battle for survival between kings, kingdoms, and even religion that set the stage for Britain as we know it. If you haven't read this book (or the other two in the trilogy, for that matter), I highly recommend you drop whatever you are doing and pick these books up! Source: Free copy from Kregel Supplement information included in the book includes an introduction to the characters. An explanation is given for those characters who are historical and those who are fiction. A glossary of Anglo-Saxon terms. A Pronunciation key of the language. A four page synopsis of the previous books in The Northumbrian Thrones.The story is divided into four parts. "Part I: RaidPart II: FamilyPart III: StrifePart IV: Reckoning"When the story begins it has only been one season since Oswald's death. Oswald had been the king, and older brother to Oswiu. Oswiu is now king of Bernicia and king of Northumbria. Oswiu and his men approach a town asking to be let in. They are refused. An awkward situation arises for this new king. He has been disrespected and rebuffed. The town of York has been told there is a different king, and Oswiu is not their king. They believe the king, determined by the witan, is Oswine, son of Osric, the Godfriend. Later, the two kings have a tense conversation. The scene ends with Oswiu being reminded of the resemblance between Oswine and Oswald. This first scene grabbed my attention. It is not a predictable scene for a king. It is a scene filled with the errors of humanity. I wondered how the new king, Oswiu, would handle this situation. I wondered if he would learn anything from this encounter. I wondered if this situation was a dark cloud that would hang over Oswiu the rest of his life: his worthiness to be a king. Oswiu's grieving mother asked him to retrieve the remains of Oswald. The journey to retrieve the remains is dangerous. The synopsis on the back cover of the book explains this mission. The book is filled with other missions, dangers, battles, marriage problems, betrayal, disunity in families, and disunity among the people. Oswiu has inherited a realm fraught with tension and peril. His anxiety is apparent. This is just one of the reasons I love his character. He is a dimensional person. I see his positive and negative character traits. He makes mistakes. He wrestles over these mistakes. And hovering over Oswiu and the story is the memory and spirit of Oswald. Several additional reasons of why I loved Oswiu:The prickly marriage alignments. They do not always work out. How the women felt, as political pawns, are explored through the story. Dialogue. I loved the dialogue between mother and son, between wives and husbands, between children and fathers, and between the kings and their men at arms. Scene descriptions. I was given just enough information to form my own picture of the scene in my mind. The scenes are crisp, clear, and vibrant. Oswiu's love for his brother. He idolized Oswald. He wished to be like him but fell short. He wrestles with the strong memory of Oswald. He wrestles with his grief. England is not a united nation. Several domains align and then break. Intermarrying does not always work. The battles always come. It was a way of life. Bleak. However, it is an unspoken way of life. The two religions. One is Christianity. The other is pagan. The styles of worship is portrayed. The people depend on a higher power for everything, from domestic to war. Continuing brilliance!Following my new rule for my 'tbr' pile, I read this book, the third and final book in the Northumbrian Thrones series, immediately after reading the first two and can only re-itterate that Edoardo manages to achieve the brutal depiction of life in a barbaric age with atmosphere and tension rather than with loads of blood and gore.This book continues with the history of Northumbria following the killing by Penda and subsequent dismembering for sacrifice of Oswald, the High King and elder brother of Oswiu. Edoardo provides us with a short recount of the events that occurred in the previous books and combining this with the useful 'Dramatist Personae', glossary and map it is certainly possible to read and enjoy this book in isolation, although I would highly recommend reading all three books in succession if you haven't already done so.This tale differs somewhat from the previous two because Oswui lacks the confidence and prestige of his predecessors and is a much more fallible individual who suffers from self-doubt because he had been unable to save his brother. As a consequence, Oswui must make sacrifices and act with great diplomacy to regain the standing of his family and to garner the required support to enable him to avenge the death of his brother. We therefore have many more important players in the game. Once again, the men of the cloth play an important role but it was particularly refreshing to see so many steadfast and brave female characters.Along with all the necessary political posturing there is plenty of of action. Out of the blocks, Edoardo takes us on a breath-taking and somewhat gung-ho and mystical journey into Mercia for Oswiu to retrieve his brothers corpse, fast becoming a holy relic, to heighten his standing and to bring some closure for his mother. Another action packed highlight is the unsuccessful siege of Bamburgh Castle.Finally, we have the smouldering build-up to the inevitable dramatic conclusion to this tale, Northumbrian versus Mercian, Christian versus Pagan, Oswiu versus Penda, another beautifully depicted event and, dare I say, finally a happy ending because, unlike his predecessors, Oswiu is lucky enough to enjoy a relatively long life and to die peacefully in the bosom his family.I can't wait to find out what Edoardo will be delighting us with next. This trilogy is one of my favorite pieces of historical fiction - and definitely the best piece of historical fiction I have read from this time period. The characters are rich but still true to the basic source-texts we have, and the plots are likewise dynamic but still faithful. One of my favorite things about Albert's writing is his ability to fairly and fascinatingly balance the dynamic of politics, culture, and the Christianity of late Britain/early England. I enjoyed this book, though - like the characters themselves - I loved Oswald more than Oswiu, and thus loved his book a little more. There were more slave girls in beds (albeit still PG-13), and the whole dynamic of the novel was less encouraging than the first two, though the ending is truly epic. Oswiu: King of KingsThe Northumbrian Thrones #3By Edoardo AlbertFollowing the murder of his brother Oswald, Oswiu has taken the throne. But the death of the high king has torn the alliances that had once held the kingdoms together. Add to that treachery and betrayal within his own kingdom and Oswiu has a lot of work to do if he hopes to rebuild his brother's kingdom.As Oswiu and Penda each manipulate and position themselves to make alliances to strengthen their claims but at the same time the old and new are vying for the hearts of the people. Will the old gods lose to the new God and his message of salvation spreading through the land?This is a period of violence and upheaval that was truly a dark age but this was the foundational shapings of a nation that still stands. One can honestly say that perhaps the choosing of those whom one calls friend and adviser is the most important decision one can make when leading. Throughout this series a poor choice can lead to regret and even loss of life. I really enjoyed this chance to explore this time and place in history. The author Edoardo Albert brings to life the characters - some of whom the reader can empathy with, while others make one cringe as they enter the scene. There is a synopsis of the two previous books at the beginning of the book to refresh the reader's memory as well as a listing of the important personages from the book (and series). The author includes historical notes at the end of the book allowing the reader and insight to the few literary liberties that occurred as well as a glimpse into what happened after this story ended. This series must be read in order to fully appreciate and understand the subtle and not so subtle undercurrents of a land and people on the cusp of change.I was provided a review copy of this book by the publisher with no expectation of a positive review - all expressed opinions are my own. 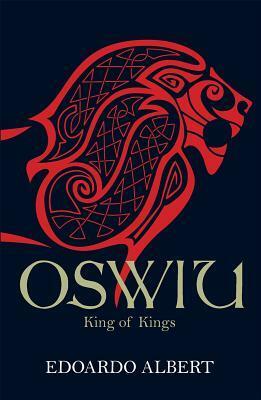 Oswiu: King of Kings is the concluding book in a trilogy detailing his ascension to the throne during the Dark Ages (early 400AD). One gets a very clear glimpse of a time of barbaric wars rife with deceit and treachery. When kings made alliances and entrusted their children to foreign kings for the sake of peace. Oswiu's family had forsaken worship of pagan gods and were followers of the one true God. But the pull to return to the familiar gods of their ancestors was an ever present struggle. Especially when surrounded by enemy kingdoms who mock your God.It's quite a sweeping trilogy that is based in large part on fact, helpfully explained by the author in his end notes. Written histories from the Dark Ages are understandably scant but Edoardo Albert has pieced together as much as he can to create the skeleton of the story and then added vivid details to flesh out the body of the work.For those who have not read the prior two books (or who need a little refresher on the details), the author provides a very helpful summary of books one and two. I would, however, strongly recommend beginning with the first book to understand much of the power struggles. A complete cast of characters and a bit about each is included at the beginning of the book as well as a glossary for words which may be unfamiliar to readers. And lastly, the author includes a brief pronunciation guide. All excellent resources for readers!Disclaimer: I received a copy of Oswiu: King of Kings from Kregel Publications for the purpose of review. No other compensation was received. swiu: King of Kings is the conclusion of the Nothumbrian Thrones novels by Edoardo Albert. Oswiu's brother Oswald was recently killed by Penda, king of Mercia, But rumors have spread that the site of Oswald's death has miraculous qualities, healing the sick and injured. His mother Acha urges Oswiu to recover his brother's body, but the new king has few men and little support; wouldn't it be a death mission?Since this book concludes a trilogy, it is best read after the previous two books, Edwin: High King of Britain , and the sequel Oswald: Return of the King. Together, the three books provide an intriguing look at British history in the early- and mid-600s, as well as the interaction of paganism and Christianity. The unfamiliar names of tribes and individuals may make this confusing for some people, but the author has thoughtfully provided a list of main characters in the front of the book.I enjoyed this book and recommend it to anyone who likes historical fiction of the Middle Ages, as well as epic fantasy fans. The author is careful to distinguish between fact and fictional invention in his afterward, as well as citing some of his historical sources.I received a free copy of this book from Kregel Publications in exchange for an unbiased review. A year after the death of his brother, Oswiu carries out a daring raid into enemy territory to reclaim his body. Coming into conflict with Penda of Mercia, Oswiu succeeds in his quest and returns Oswin's remains to his family. However not all Oswiu's advisors are true and, on advice, his sets aside his wife to make a dynastically advantageous marriage. Meanwhile Penda grows ever more strong and a final reckoning between the two is due.This is the third in Albert's trilogy about the three brothers who became High Kings of Bernicia and many of the areas of Anglo-Saxon Britain. Weaving together history and a certain degree of spirituality, the books have been a guide to actions in the 'Dark Ages'. having enjoyed both previous books I looked forward to the final instalment but I did feel that it fell a little flat. The narrative dragged at times and seemed to be about a series of set pieces, rather than a coherent longitudinal study. Edoardo Albert - I am, on paper at least, a surprisingly exotic creature: Italian, Sinhala and Tamil by background, and growing up in London among the polyglot children of immigrants (it was only when I, finally, went to university that I actually got to know any English people). However, it's worth bearing in mind that the work of mine that produced the most extreme reaction in a reader was, in fact, a lonely-hearts ad. The reader, a friend checking the ad for me, was reduced to a wheezing, helpless, tear-stained mess of hicoughing flesh, so uncontrollable was his laughter. This was not quite the reaction I had hoped for. One day, I hope to produce something to match that reaction, but preferably without acquiring a wife, as I later found one by slightly more conventional means.